Professional and vocational education (професійна освіта; profesiina osvita). The acquisition of specialized knowledge and skills required for entry into specific professions or occupations, obtained through educational institutions or training programs. In modern society, professional education (such as law, medicine, engineering) is acquired at institutions of higher learning, and entry into such establishments demands complete secondary education; vocational training is obtained either in secondary special schools, technical schools, or vocational schools or through apprenticeship programs. The first institutions to offer vocational education in Ukraine were the artisan schools organized in the mid-16th century by guild organizations of the Orthodox brotherhoods in Lviv (Lviv Dormition Brotherhood), Kyiv (Kyiv Epiphany Brotherhood), and Peremyshl. In Russian-ruled Ukraine, by 1716 the so-called tsyferni (numbers) schools had been established in provincial capitals to train scribes, assistants to master shipbuilders, architects, and apothecaries. The origins of professional education in Ukraine date back to the 18th century, with the establishment of theological seminaries and institutions such as the medical-surgical school in Yelysavethrad. Toward the end of the 18th century the first agricultural schools were established. In 1839 a veterinary school was founded in Kharkiv. Further development occurred with the establishment of universities—Kharkiv University (1805) and Kyiv University (1834)—and of lyceums, which emerged as centers of higher education (legal, pedagogical, and medical training in particular). A network of professional schools began to develop in the 1860s with the abolition of serfdom, the rise of the zemstvo schools, and the development of trade and industry. Professional and vocational education became the concern of district and gubernia zemstvos, some ministries, and private individuals and societies. An important role was played by Western European industrialists, who developed Ukraine’s industry, and who brought with them their own engineers, technicians, and skilled workers, from whom the local population acquired knowledge and skills. The organization of professional schools was decreed by a law enacted in 1869. Regulations passed in 1888 divided technical-industrial schools into three groups: (1) secondary technical schools, with a 4-year program for the training of technicians, (2) lower technical schools, with a 3-year program for training master craftsmen and tradesmen, and (3) trade schools, with a 3-year program for preparing skilled workers. Between 1870 and 1890 Realschulen had supplementary classes of applied mechanical and chemical studies, and had commerce departments which offered specialized secondary education. Toward the end of the 19th century important professional schools were founded, such as the Kharkiv Technological Institute (1885) (now National Technical University «Kharkiv Polytechnical Institute»), the Kyiv Polytechnical Institute (1898), and the Katerynoslav Higher Mining School (1899) (now National Mining University of Ukraine). Prior to the Revolution of 1917 there were 16 higher professional schools (including 4 technical, 3 medical, 3 pedagogical, and 2 commercial), 125 secondary professional schools (including 66 commercial, 23 pedagogical, 11 art, 9 theological, and 6 agricultural), and 535 lower schools (369 trade and industrial, 54 agricultural, 34 pedagogical, 30 theological, 21 commercial, 16 medical, and 11 art). As a rule professional and vocational education was poorly developed in Russian-ruled Ukraine in comparison with Western Europe. The tsarist regime stymied the development of the country’s productive forces and paid little attention to the establishment of a network of professional and vocational schools in Ukraine. During the Ukrainian struggle for independence (1917–20) efforts were made to Ukrainianize professional and vocational education, since all instruction had hitherto been conducted in Russian. Plans were also made by the educational authorities of the Ukrainian National Republic to organize trade schools with 1- or 2-year programs, and 4- or 5-year professional education programs at universities and institutes. Two new universities were founded—at Kamianets-Podilskyi (Kamianets-Podilskyi Ukrainian State University) and Katerynoslav (see Dnipropetrovsk University)—which offered some professional educational programs. With the establishment of Soviet rule in Ukraine, professional and vocational education was reorganized. In the 1920s the professional school became the standard secondary school, offering 2-, and, later, 3- and 4-year programs. The following types of professional schools existed: industrial-technical, agricultural, socioeconomic, medical, art, artisan-industrial, construction, and transport. Survey data for November 1929 show that there were 678 professional schools in Ukraine, with an enrollment of 88,200 students. The most numerous were agricultural schools (249 schools, with 27,000 students) and industrial-technical schools (157 schools, with 26,000 students). Professional schools were established to train a skilled work force and prepare students for higher education. Vocational training of skilled industrial workers was conducted in the factory apprenticeship schools. Established in 1920, these schools offered 3- and 4-year programs of technical training and general education to 14- and 15-year-olds who worked in factories and plants, and who had completed four grades of elementary education. In 1929 there were 201 such schools, with 30,000 students. In the 1930s the program of study was reduced to one and a half or two years. Similar schools existed for rural young people who worked on state farms (see Schools for peasant youth). Higher education was also reorganized. In 1920, universities were abolished and replaced by institutes (agricultural, industrial-technical, socioeconomic, medical, pedagogical, art, and transport) which offered professional education programs that encompassed all facets of production (theory, economics, management, and practical skills). 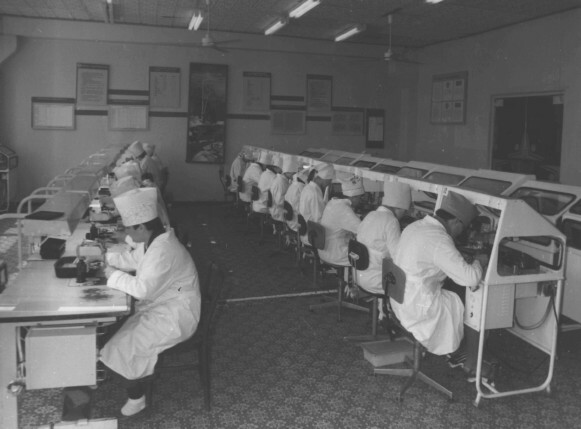 Technical colleges or tekhnikums were established on the basis of former secondary technical schools and Realschulen and were designed to train specialists in narrow, practical technical fields. In 1928 there were 38 institutes, with 33,400 students, and 126 tekhnikums, with 26,900 students. In 1929 the All-Union Supreme Council of the National Economy ordered all levels of Ukraine’s education system to be reorganized along Russian lines. Whereas in the 1920s Ukrainian had increasingly become the language of instruction in institutions of professional and vocational education, in the 1930s the trend was reversed, in favor of Russian-language instruction. In 1931, tekhnikums were reduced to the status of secondary schools. By 1933 some professional schools had been transformed into schools that offered secondary special education; others had been liquidated. In 1934 Kharkiv University, Kyiv University, Odesa University, and Dnipropetrovsk University were re-established. Tekhnikums were charged with the preparation of specialists at the intermediate level, and institutions of higher education (institutes and universities) were to offer advanced qualifications. Institutions of higher technical education with a three- or four-year program were organized in larger industrial enterprises. Under the impact of rapid industrialization the number of institutions of higher learning grew from 42 in 1929 to 173 in 1940. The student population increased from 40,900 to 196,800, and most students were trained in narrow, highly specialized technical fields. With the approach of the Second World War the supply of labor from the tekhnikums and factory apprenticeship schools was deemed insufficient, and in 1940 the Main Administration of the State Labor Reserve was established with its own schools. All vocational training schools below the level of tekhnikums were placed under the jurisdiction of this highly centralized institution. In 1959 the labor reserve schools were transformed into urban and rural vocational-technical schools, and the whole system of vocational training was transferred to the jurisdiction of a state committee of the Council of Ministers of the Ukrainian SSR. Under Nikita Khrushchev an attempt was made to unify secondary general education with rudimentary vocational education, in a system of specialized secondary and higher education offering practical experience of production processes in enterprises. The attempt failed, and in 1964 professional and vocational training was again reorganized. In Western Ukraine under Austrian rule, in the 19th century professional and vocational education was poorly developed, and both the authorities and the Ukrainian community focused on the development of the general education school system. Lviv University and Chernivtsi University offered professional education, although few Ukrainians were enrolled there because of discriminatory policies. The Lviv Higher Polytechnical School was founded in 1844, and there were veterinary schools, agricultural schools, and forestry schools in Lviv as well. There were practically no public vocational schools with Ukrainian as the language of instruction, and only one private secondary-level trade school, operated by the Prosvita society in Lviv. There was also a Prosvita agricultural school of lower rank in Myluvannia. In Western Ukraine under Polish rule, professional and vocational education continued to be weak. The most highly developed professional schools were institutions offering pedagogical training. Professional education organized by the Galician land board was poorly developed; there were only a few schools at the secondary level (eg, commercial art and trade schools in Lviv) and a few more of lower rank (primarily vocational schools). Polish was the language of instruction. In 1937–8 there were 146 secondary vocational schools (91 in Galicia and 55 in Volhynia), with 22,000 students (17,300 and 4,700 respectively). The number of Ukrainian students attending these schools was negligible because the transition from rural elementary schools to professional and secondary schools was difficult. In Galicia the Ukrainian community gradually developed private professional schools—four secondary and eight lower schools. In the Lviv school district, out of 154 secondary and lower vocational schools only 13 were Ukrainian-language institutions; out of 97 schools offering supplementary vocational instruction 5 gave instruction in Ukrainian, and all were private institutions. Various community organizations, such as the Ridna Shkola society and the Prosvita societies, offered short-term vocational courses. During the Second World War, under the Generalgouvernement, professional and vocational education expanded owing to Ukrainian community efforts. There were 330 professional schools, with 81,885 students. In 1941–2, higher education programs were organized in the fields of medicine, veterinary science, pharmacy, technology, agronomy, and forestry. In Bukovyna, under Romanian rule, there were few opportunities for professional and vocational education. In 1927 all Ukrainian-language schools were closed. Transcarpathia, under Czechoslovak rule, was in a better situation. In 1938 there were 5 teachers' seminaries (4 with Ukrainian as the language of instruction) and 3 secondary vocational schools (all Ukrainian, including the Trade Academy in Mukachevo), 9 lower vocational schools (of which 8 were Ukrainian), and 151 supplementary vocational schools (113 Ukrainian). In contemporary Ukraine lower-grade vocational education is provided in vocational-technical schools, which, beginning in 1969, have gradually been transformed into institutions of secondary education offering general education as well as instruction in a specific trade. Full-time and part-time programs are offered that vary from one to three years. In 1986 there were 1,100 such schools, with 742,000 students. Institutions of secondary special education provide middle-grade vocational or semiprofessional education (for the training of technicians, paramedics, and the like). In 1987–8 there were 734 specialized secondary schools, with 800,600 students (of whom 524,300 were in full-time day programs). Schools specializing in commerce and business had 106,800 students in 1987–8; machine-building and -equipment secondary special schools had 102,200 students. Various institutions of higher education train specialists with advanced qualifications. In 1987–8 there were 146 such establishments in Ukraine, with 852,300 students, of whom 454,500 were in full-time day programs. The largest number of students, 321,300, were in industrial and construction institutes, and 248,800 were enrolled in pedagogical institutes. Institutions of professional and vocational education were under the jurisdiction of various all-Union ministries in Moscow or of ministries in Kyiv. The number of students admitted to these institutions in any given year was determined according to a plan. Graduates were given employment by the appropriate ministry and normally had to work at the designated position for three years. In some years up to 18 percent of Ukraine’s graduates were given jobs in the USSR outside Ukraine. In the late 1980s there was much discussion of the quality of vocational and professional education, its failure to keep pace with technological and scientific progress, and its emphasis on narrow specialization. The extreme Russification of this sector of education and the lack of opportunity to study in the West were also criticized. In 1987 only 25 percent of the courses in institutions of professional and technical education were taught in Ukrainian, and there were virtually no textbooks written in the Ukrainian language. Starting in 1988, however, the use of Ukrainian slowly expanded. Institutions of professional and vocational education were also organized by Ukrainian émigrés in Czechoslovakia—notably, the Ukrainian Husbandry Academy, the Ukrainian Higher Pedagogical Institute, and the Ukrainian Studio of Plastic Arts. After the Second World War professional and vocational programs were organized for the large number of Ukrainian refugees in various displaced persons camps in Germany and Austria. In Germany, in 1947–8 there were 26 professional schools and courses, with 1,163 students, and in Austria, 8 secondary professional schools and 140 professional courses of various types.